Whilst the drivetrain is improved it is the new chassis that Lexus maintains is the biggest step forward. Sitting on an all-new platform with multilink suspension at the front and rear, the GS has been set up with active dampers and a new dynamic handling package that allows the driver to select two differing levels of sports mode, as well as normal and eco settings. The result is a substantial improvement on the current model. Body control is noticeably improved regardless of the chosen setting, so there’s now less dive and lateral body movement; particularly noticeable over bigger bumps at lower speeds. The 450h gets the dynamic handling pack as standard, and that brings with it rear-wheel steer, which translates to a much sharper turn-in. It can feel a touch nervous initially but with familiarity you become used to just how little steering input is required. Whilst this doesn’t mean there’s any genuine sensation to the steering it does make the GS feel more nimble whilst also improving stability. Autocar also estimates 45mpg for the revised 3.5L hybrid power train, which would translate into a U.S. rating of 37.4mpg, for a 14mpg improvement over the current GS 450h — highly unlikely, to say the least. 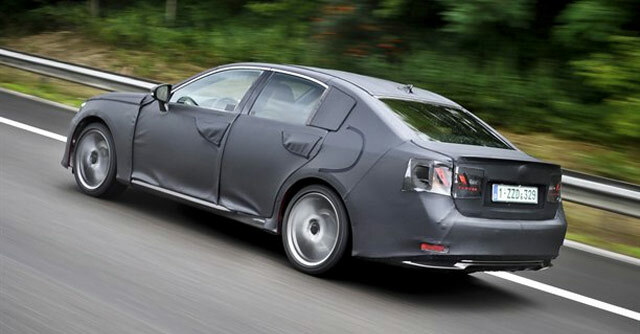 Diessel_xp: I believed is the GS HYBRID,take a look the rear bumper dont have tail pipe like the regular GS.